KimmyKokonut » Blog Archive » Childhood Food Favorites-improved! I’m sure it’s noticeable that I am blogging with more frequency lately. I have more time recently to dedicate to my blog, which kept slipping to the bottom of my list of things to do. Now the blog is back near the top of the list, especially since it is October and I have joined the ranks of the Vegan Month of Food, where all bloggers, regardless of any sort of discrimination, are encouraged to blog about anything and everything vegan-friendly. Kittee is maintaining the list of all the bloggers participating (there are over 360 this year! ); so head over there if you want to discover some new blogs to read. There’s also a daily roundup if you are overwhelmed by lists and enjoy summaries, which I do. I know I don’t have time to read a million blogs a day but last year I ended up finding a few new blogs that I still follow. Today will be a brief tribute to the food that brings us back to family gatherings, comfort food. I grew up in a very food-oriented family. Not the type that went out to eat a lot or ate from the pages of Gourmet. We were the family that ate together every night, gathered around the table eating what my mother put in front of us. It was usually home-cooked, simple and delicious. My parents maintained an impressive vegetable garden in our yard so we ate seasonally before it became a fad. Waiting for the asparagus to pop their tips out of the ground made it that much more special to eat it. Playing silly games as a child where I harvested as many green beans as possible to put in my little schoolbag as my energy storage chamber which was pinned to the clothesline. I would die if I didn’t go back often enough to refuel on beans. Yes, that was me. I still remember the light layer of peach fuzz that were on our green beans and how satisfying it was to crunch into them. I can only find that taste in freshly-picked beans. Some foods have been ruined for me because of my access to fresh produce as a child. I hate buying tomatoes in the store, they do not taste right to me. And that’s okay, I really don’t need to eat tomatoes in December. My fascination for food has grown into an obsession as time passed. I enjoy cooking to the point of exhaustion. I love to look for new and exotic recipes to try, with fun flavor combinations or interesting ingredients. But I usually find myself craving dishes that were served in my childhood. There is one dish that sticks out in particular that I haven’t had since I was a child. Broccoli casserole. My aunt used to make it and we only went to her house once a year, making it that much more special. They had a pool and a dog, what more could a child want for? This was her signature dish that we came to rely on and expect at gatherings. 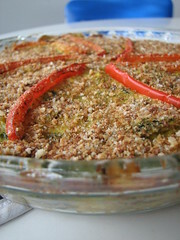 It was basically a crustless broccoli quiche with bread crumbs on top. I don’t have the original recipe but this one tastes pretty close. It wasn’t very firm like some quiches can be, it was soft and eggy and full of broccoli. Perfect for tofu to sneak it’s way into. I modified the broccoli quiche recipe a bit from Vegan Brunch, adding broccoli stems (cut fine), removing the crust layer, covering it with bread crumbs and voila! Instant childhood memories. I love this quiche for a number of reasons, mostly because it’s fatty from the cashews so it’s not just tofu-y, which tends to bore/annoy me. I have tastebuds for salt and fat and nuts help fill the void. It tastes great cold, too, which is how I ate most of my leftovers as a child. Apple crisp for breakfast tastes best straight out of the fridge, trust me. So thanks again, Isa, for taking the guesswork out of veganizing an old family favorite. Now I can just eat it and enjoy it along with the attached memories. I like that recipe too! I thought it was much better the day after. I love broccoli casserole too! Mmmm that looks lovely. I miss a good quiche. GOD! I totally posted the wrong comment here. That’s what happens when you multi blog read! I love the idea of you ‘refueling’ on green beans. I had a hard time with store-bought tomatoes after Shane’s first garden. We pretty much don’t eat them out of season now. But when it’s time…yum. Need to get Vegan Brunch. I enjoy the combo of creamy, savory, squishy things with crunchy bits on top.